Sponsored by the Thomas Gardner Society, Inc.
As we continue our emphasis on research and review which can involve a long period of quiet, we thought that a status update might be in order. There are a lot of things on the plate. As we proceed, we will continue to use this blog for posting general reports and for commenting of things of interest to the Thomas Gardner Society, Inc. The technical blog will be used for those things dealing with the details whether of content, configuration, or other. The following addresses a few things that are of special interest. - This year, the Thomas Gardner Society will offer two types of membership: descendant and supporting. The former will offer a means for those who descend from Thomas and Margaret to provide supported documentation of their lineage. We are preparing the application process. Those are interested in membership, or in making contribution to the Society, please contact Ann at algswtlk[@]aol[.]com. - Some NEHGS offerings are of special interest, given that we are working on an application process. For one, a recent video talks about lineage societies and how one applies to them: How to Apply to Lineage Societies: Tips from NEHGS. This can be used as an introduction to the general ideas. As an aside, we are going to ask for documentation from the applicant's great-grandparent out. That is, more recent information related to the applicant and spouse(s), the applicant's parents, and the applicant's grandparents ought to be considered private and privileged, and handled thusly. From what we have seen (to be discussed) so far (many applications), we wonder just how respectful are these storage methods. There is much to discuss, but those pieces of recent information ought to be collected and verified once. By whom and how? Then, whoever might need the information would get redacted results. There are (ought to be) ongoing discussions on this matter. So, the applicant can expect to offer a lineage from about three generations out to Thomas and Margaret. We will collect these into a fully-sourced, accessible, document (technical choices under review). Prior to submitting an application, though, one needs to have details about one's lineage and its acceptability. We will address this further (technical post, soon). However, R.C. Anderson, recently, published a book on his methods (Elements of Genealogical Analysis) that were developed through the Great Migration effort. - The technical post (see Remarks, 10/31/2014) mentioned in the prior bullet will deal with the format for supporting documentation. We, personally, have submitted packets of 50+ pages in support of applications (with some complaining of the size - however, one genealogist did say that the application that we have submitted was one of the best that he has seen in terms of supporting material presenting a cogent story). At the same time, an organization that allows use of another society's information can result in a much smaller packet. For one example that we can show, a D.A.R. Record Copy can replace 17 pages. In the 50+ case, that would leave 33+. For some reason, many genealogists don't seem to trust others (this is something to analyze, to boot). On the other hand, we can also show an application with a mere 7 pages with the D.A.R. Record Copy. That later case may be too small, but not if it references easily accessible information. The support material, essentially, consisted of links to on-line material with a small snap-shot from each source. Silly? No. Let's use Rich Hall's work (see below). He has the "famouskin" site (take off on some works by G.B. Roberts of NEHGS) which shows how celebrity and its attention motivate filling in genealogical pieces. So, finding famous cousins may offer help to researchers. we have found it to be so. That is, have you not heard that the rich and famous get the genealogical attention? Or, the corollary? Many with pedigrees have been ignored due to several reasons, such as lack of resources, nobody interested, etc. So, take this example, please. We'll use Edith (Carow) Roosevelt. 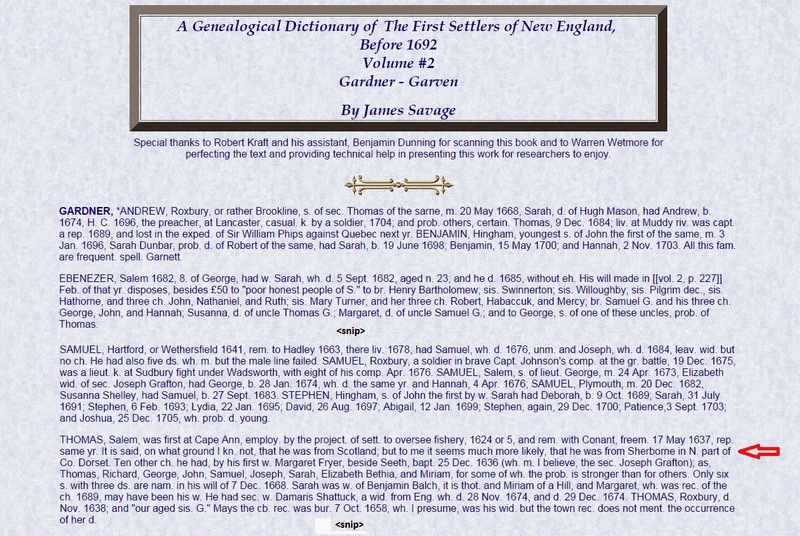 She is a Thomas descendant (see above NEHGS link, plus Gardner's Beacon, Vol. IV, No. 3). Let's see how Edith relates to Sir George Downing. There are other examples, but we picked George as his sister, Ann, married Joseph Gardner. In the top box of the Edith graph, mouse-over either Emanuel Downing or Lucy Winthrop. Notice the drop-down menu. Also, notice that you can transition over to a lot of the sources and read the material. That will be a focus of the presentation that we expect to pursue. - Now, having said that about sources (prior bullet), we will use the ahnentafel of Lucy Foster Wilson Gardner who was the grandmother of Dr. Frank A. as the means to demonstrate the ideas. There are many ways to approach the task, but we will convert the PDF material to a linked HTML file. Notice that the ahnentafel is fully sourced with footnotes. Just about all of those source references are to on-line material. In the application process, we expect to use about a third of the pages (see above application reference, 50+ pages). That requirement comes from requiring a snapshot, in time, of the source material, principally to overcome the latent fallibility of the web, non-persistence - there until we see semantic approaches have more wide-spread use in genealogy and family histories. 10/28/2014 - The 400th anniversaries are a more remote focus. 10/31/2014 - See start of technical discussion: Supporting material. 03/02/2019 -- We're build an index via images at our portal to truth. Savage (1784 - 1873) pre-dated Dr. Frank's (1861 - bfr 1940) career. Anderson (Great Migration) does use Savage's work; Dr. Frank's work is missing from the series (at least, from the part dealing with Thomas Gardner). Notice, in the image, that Savage mentions Margaret Fryer. Now, this is not the first time that I looked at Savage's work. For the most part, it has been helpful. I marvel at his stamina (put yourself in his shoes, in his times, and in the limited milieu - technologically speaking - within which he worked --- by the way, same goes for Dr. Frank's later work) and productivity. 10/12/2014 - Subsequent discussions will consider the Tabula Raza issue, for one thing. Also, our focus on collecting what was known (or thought to be known, say, for example, whence) and when it was known (and how supported) and by whom (over the whole of the almost 400 years - see Annals, for starters) and all of that (including what the Great Migration project documented) is apropos to the state of knowledge. Savage did have his head in the 18th century as did Rev. Felt. 03/02/2019 -- We're building an index via images at our portal to truth. We have more information about Margaret Friar and her folks. During the past five years, I have seen lots of sites. Some of these have been around awhile and show their age. Others are too new to know how they will persist (as in, be more than a flash in the pan). Now, Wikipedia has been evolving quite well: Thomas Gardner (planter) - the critical remarks will be there until we redo the page (imminent). Be aware that there are subsidiary pages to maintain, such as Old Planters, Great House (Cape Ann), and more. So, running across WikiTree (Thomas Gardner) today caught my interest. Notice that there have been comments introduced on the pages of Thomas and Samuel. Rather than start our own WikiTree (see discussion), ought we lean into what has already been done? 10/03/2014 - I have seen this before, but it looked incomplete given what has been published. For instance, there was nothing for Samuel. Dr. Frank A. (1st cousin, twice removed) is a descendant and filled in the information in his 1907 book. That brings up a question: why did the Great Migration Project ignore Dr. Frank A. 's work? 10/06/2014 -- Early Families of New England study of NEHGS. We can do something similar for Thomas descendants. On a wildcard search, there were 7,289 records (some are mentions, only, in the profiles of others). Still, the project is moving forward. So, that means that I'll spend some time reviewing what they have for the trees that I know (Lucy, Susan, ...). Plus, some of the "planters" such as Humphrey Woodbury - he has five pages - and others related to Cape Ann. ... Introduction from American Ancestor, Spring 2013. 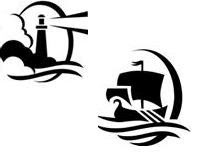 08/26/2015 -- Changed pointer to site for the Early New England Families Study Project. 05/31/2018 -- Changed the NEHGS FS link. Added regular look for Comments to the blog maintenance process. And, got re-inspired to visit WikiTree (comment to Sherborne, Dorset). Watch What's New and Facebook (Technical Discussions).